I was under the impression veggies always got their male flowers first? Is this going to be bad for my zuc? Re: Zucchini - Female Flowers First? nes wrote: I was under the impression veggies always got their male flowers first? You are right, it is usually the male flowers that start flowering first, but you never know with summer squash. You're not the first person I've heard of that's had all females and no males. 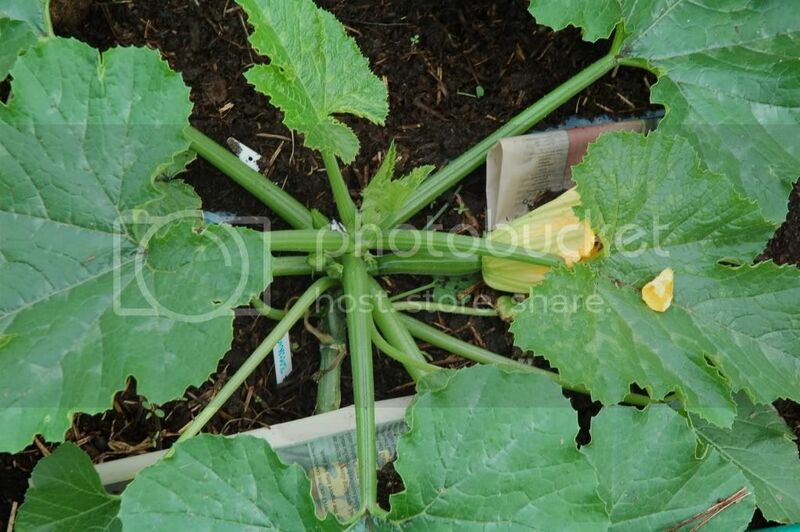 With zucchini, it always seems to start of kind of lop-sided concerning the flower type, but will even-out with time. Zucchini is one of those "just give it time" plants . Now drop what you are doing and go check that plant for red eggs on the underside of the leaves. I just pulled of 5 leaves full of them, they are squash bugs. I had a few that had just hatched so I got there just in time. If I had waited I would be swarming with them little buggers. Keep an eye out for them throughout the season but if you can get them at the right time it shouldn't be a problem. DO NOT put the egg cluster in your compost. I sprayed them with soap than into the trash can they went, with the can placed in the sun so they cook. Ummmm! Smells like chicken. zucchini pic, is this the start of a female flower? ?